In response to a statement from the Department of Labor and Employment (DOLE) that there is no mechanism to detect illegal forms of contracting, the labor group Partido Manggagawa (PM) said that existing visitorial and enforcement powers enable the government to catch violations and impose compliance. “What is lacking are not the means to detect red flags but the will to enforce existing rules and laws against prohibited contracting,” argued Rene Magtubo, PM chair. 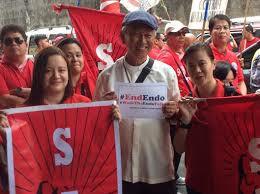 Tomorrow afternoon PM together with other labor and church groups under the Church-Labor Conference (CLC) are gathering some 100 leaders at the CICM compound in Quezon City to consolidate their campaign plans to end endo. CLC will map out its interventions in the ongoing review by the DOLE of Department Order DO 18-A and finalize its proposed amendments. Last July 1, CLC mobilized several hundred workers from different groups in a rally at the DOLE to present its 10-point proposals on eradicating contractualization. “While present rules and laws already lays down sufficient guidelines and prohibitions that can and must be enforced, DO 18-A and the Labor Code provisions on subcontracting should still be amended to strengthen security of tenure and plug loopholes. For example, revise DO 18-A to ban contracting out of regular jobs, meaning work that is necessary and desirable to the business or trade of the employer,” Magtubo clarified. “The DOLE can access employee records, review payroll lists, enter company premises any time of the day or night, interview any worker, all for the purpose of ascertaining facts and conditions relating to violations of DO 18-A or of labor laws as a whole. How can the DOLE be unable to find red flags with such vast powers?,” Magtubo insisted. PM has proposed the deputization by the DOLE of labor unionists to beef up the cadre of labor inspectors and accelerate the inspections of establishments.